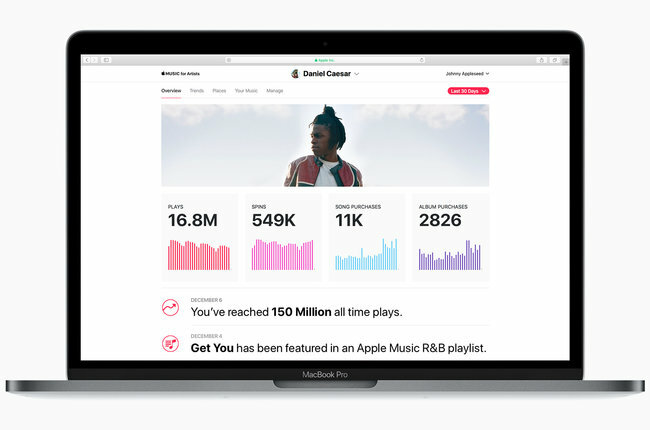 Apple has launched a new dashboard for artists to have an insight into their fans’ listening and buying habits. Dubbed as Apple Music for Artists, the beta rollout features thousands of select artists who will use the product and review it for possible adjustments and expansions. The company plans a broader launch later this spring to several million artists with content on iTunes and Apple Music. Apple also plans to release a mobile app for the service. The dashboard is fairly easy to navigate, as it shows artists the running number of plays, spins and purchases (songs and albums) by fans. The artist can also filter results by picking a period from the Apple Music launch in 2015 to the past 24 hours. The Insights panel shows a list of milestones, including the all-time high in plays and purchases per song or all songs. Spotify, YouTube and Pandora already have their own dashboards for a while. Some of these competitors’ dashboards for artists offer tools to connect with fans through audio messages or notify them about live events, new releases, ticket promos and more. Despite the late arrival, Apple says that its entry has more in-depth info, transparency and convenience to users. It can track both streams and sales at a granular level. Apple says that artists can check how their songs or albums are performing in 115 countries where iTunes or Apple Music is available. Artists can pick a city or cities and see how many plays or purchases they have in that market. It also shows the top songs in each of these cities. For deeper insight, artists may check the listener demographic per city, such as how many times male listeners age 16-24 living in New York listened to a song. Apple Music for Artists helps artists decide which cities to write down in their tour routes. If listeners in a city have some of the best responses, the artists can add one more stop in their list, or even extend performances. It also gives them an overview on the songs to include in their set list. Apple playlists tell artists how many plays they receive and their songs or albums are trending over time. Billboard says Apple wanted to add financial insights but chose not to for the immediate launch, partly due to how complex calculations are for royalty payments. Apple says Apple Music for Artists will help independent artists the most, especially those who had a challenge gathering info on market penetration and more. As a truly independent artist with a small team, music analytics is something we can’t do without. We don’t have the luxury of deep major label market research to rely on to help us make important decisions like where to perform and how to advertise the things that we make. Apple’s analytics tool helps to level the playing field for artists like myself.